Social Entrepreneurship as Sustainable Development, Introducing the Sustainability Lens. This book challenges readers to imagine social entrepreneurship as an innovative, creative model for building justice and sustainability. Building upon the work of J. Greg Dees, the author explores the concept as a change-based process that creates social value through bold innovation and creativity, providing a “how and why” approach that makes social entrepreneurship accessible to all. The chapters present a holistic way in which to realize the United Nations (UN) 2030 sustainable development goals through the four quadrants of the Sustainability Lens: Resources, Health, Policy, and Exchange. The work is written in an interdisciplinary format which will appeal to multiple learning styles among professors, students, and communities investing heavily in the development of entrepreneurial skills. “Tamara Stenn’s writing abounds with energy. Her work redefines basic concepts of sustainability and social entrepreneurship that for too long have been under the sway of narrowly conceived economic mandates such as the necessity of growth. Drawing upon customary understandings of Suma Qamana or ‘living well’, she presents a vibrant alternative to Western ideas of living competitively. Most importantly, Stenn’s writing points to another future that is both necessary and becoming possible.” – Professor Paul James, Western Sydney University, author of Urban Sustainability in Theory and Practice. “Social Entrepreneurship as Sustainable Development: Introducing the Sustainability Lens” is a timely and powerful approach to looking at Social Entrepreneurship. 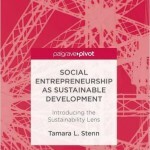 Tamara provides a set of important concepts in practical ways that allow those aspiring to be social entrepreneurs as well those already practicing socially conscious business to apply to developing a more sustainable future. – Dr. Kenneth Williams, Interim Dean, Sit Graduate Institute, USA. 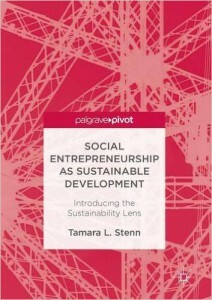 Tamara L. Stenn is Adjunct Professor in the Sustainable Development program at SIT Graduate Institute, VT, USA and Visiting Professor of Social Entrepreneurism at the University of Massachusetts, Amherst, USA. Her areas of academic interest include solidarity economy, Andean ways of being, and sustainable development.